The Postmortal is pitched as a darkly comic satire about a world where a cure for aging is invented and becomes widely available. However, if it is a satire, it is of a character most similar to Jonathan Swift’s infamous essay advocating the cannibalization of Irish babies as a solution to poverty. If you happen to smile while reading The Postmortal, I imagine it will be a mirthless rictus intermingled with horror rather than anything signifying amusement. For my part, I don’t think I laughed a single time reading the book in a mad rush over the past two days, but I don’t count that as a mark against it. In fact, I found it both gripping and chilling in equal parts. When the cure for aging, commonly known as “The Cure”, is first invented, doctors are quick to point out that it isn’t actually a cure for death, either by cancer or a more violent end, but that and the fact that it is initially banned by the government don’t stop the main character, John Farrell, from spending seven thousand dollars at a black market clinic to get cured at the age of twenty nine. The narrative follows John over the next 60+ years of his life, as he learns what it truly means to have eternal youth from both a personal and a global perspective. An early scene where John takes his roommate back to the same clinic to get the cure sets the tone for the rest of the story, as unexpected tragedy decisively intrudes. John’s life is forever changed in an instant, both by the looming spectres of death and destruction that seem to lurk just around the next corner for the rest of his life, and by the fleeting glimpse outside the clinic of a beautiful blonde woman he feels certain he will meet again some day. Magary does an excellent job of setting up a palpable sense of dread very early on in the book; we quickly learn to expect that nothing good will ever come to John without some greater evil following quickly behind. The book alternates between John’s journals/life recordings and excerpts of articles, interviews, and news headlines. We soon get a fuller picture of the way that the cure for aging affects the world around John in new and terrifying ways. One particularly chilling article recounts the story of a woman who gives the cure to her child so that the girl will stay a lovable, innocent baby forever. Magary also spends a good amount of time establishing the particularly catastrophic results of the cure in already over-populated China, and you get the sense that an entire novel could be set in that particular corner of the apocalypse. The book jumps forward in time over the decades of John’s artificially extended life, and we watch as his personal tragedies and disappointments all add together to transform him from a hopeful young lawyer to a cynical, hardened “End Specialist”, a sort of bounty hunter who ekes out both euthanasia and questionable justice as forms of legalized population control. My only real criticism of the book is that John still felt like a bit of a cypher by the end of the story; Magary does a great job of portraying the personal hardships that he experiences over his long life, and we get little snapshots of emotion and grief, but John feels more like a window into the world rather than a fully lived-in protagonist. The Postmortal is a brisk read even at just under 400 pages in print, and if I hadn’t started reading it so late at night, I might have finished the entire thing in one sitting. The scenes of action peppered throughout the book are written in a clear, compelling style, and Magary has a knack for grabbing the reader just in time to show them how bad things can get. 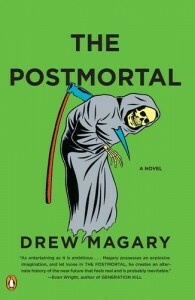 The brightly-colored cover and the author’s history as a comedy writer are a bit misleading considering the searing bleakness of his debut, but if you can stomach it, The Postmortal is a incredibly thrilling piece of dystopian gallows humor, and I highly recommend it.